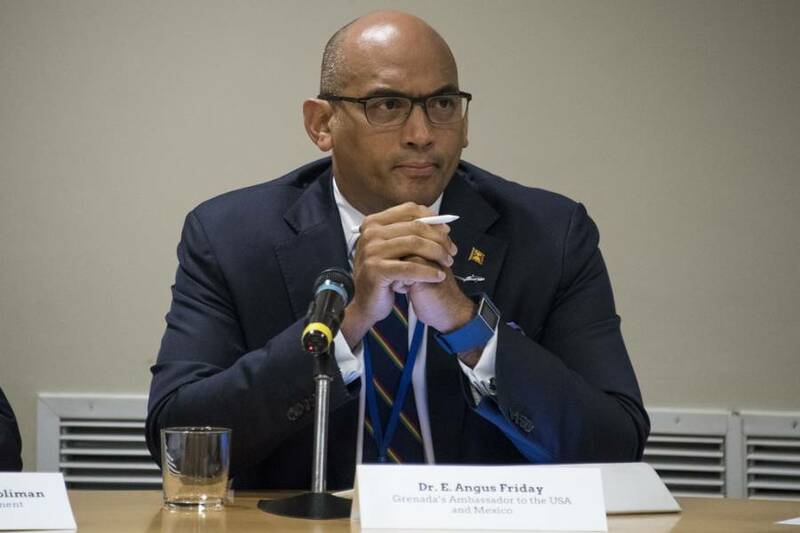 Foreign Affairs Minister Peter David has confirmed that Grenada is to appoint a new ambassador to the United States of America and Mexico, because Dr Angus Friday who was appointed to the post as of September 2013, has returned to the island. “Though there is no one there at this moment, he is on assignment until the post is filled,” David said in a telephone interview on Thursday. The Ministry of Foreign Affairs is yet to officially inform the public that its Washington office is without an ambassador. It is understood that Attaché Dianne C Perrotte is presently the head of the Washington office. Friday indicated his departure from the post since early April 2018. Presenting the feature address at the inaugural awards of the Grenada Hotel and Tourism Association (GHTA) on 7 April 2018 at the Grenadian by Rex Resort, he informed the audience comprising mainly of tourism industry stakeholders that he would conclude his service with government as the USA Ambassador as of 30 April. “This is my last month on the job and I am very happy to be returning home,” he said, reminding them that he had been away from Grenada for 10 years. He did not say if he was recalled from duty or concluded a contractual arrangement. In July his Facebook page said that he had left the job, and on 13 August 2018 he posted a farewell message. “It was an honour to serve #Grenada as Ambassador to US, Mexico, Canada, OAS. THANK YOU!!! Crowning achievement is $1 *Billion* raised for a regional initiative conceived by Grenada, supported by 26 countries and 40 private sector entities to bring to fruition,” said the post which also paid tribute to the team of people he has worked with over the years. According to his social media Linkedin page, Friday is now the Executive Chairman of the Atlantean BioSphere Programme; Co-Chair of The Blue Innovation Institute and Advisor to the Caribbean Climate Smart Accelerator. The Caribbean Climate-Smart Accelerator is an ambitious goal involving Grenada and 25 other Caribbean nations and private donor partners aimed at making the Caribbean the world’s first climate-smart zone. The Accelerator is an entrepreneurial engine that catalyses and fast-tracks priority initiatives towards a “climate-smart” zone, delivering resilience, social development and broad-based economic growth for the Caribbean. Over the next 5 years, it will do so by identifying and uniting commitments to building a more sustainable and resilient future for island nations through collaboration between national governments, regional and international institutions as well as public and private sector organisations. Grenada and 25 other Caribbean government heads and some of the largest global companies, financial institutions, and foundations have joined the Accelerator in the aftermath of the 2017 hurricanes.